Part 1 – What does $2m buy you? My perspective on how expensive housing is! 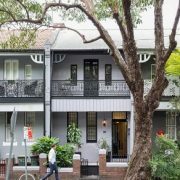 A quick trip to Sydney in December last year, left me thinking Sydney property is expensive! And just not on a relative basis. If you look at the Corelogic figures below, it shows that the Median Sydney house price is circa $884,000, Melbourne’s is $721,000 and Perth is $462,000. 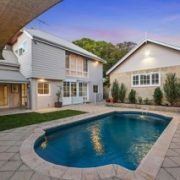 Is Sydney’s property really 90% more expensive than Perth’s and Melbourne’s 56% more expensive than Perth’s? Well, to me I‘ve always thought the numbers hide the fact that the difference is even more than this. This is because a house in Sydney and Melbourne is very different to a house in Perth. I’m not going to get into which city is better to live in but actually give some examples of what dollar comparable properties are like in the different cities. From my completely anecdotal example of the below, here is what I found. 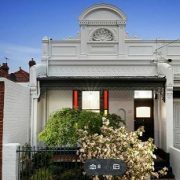 I started by looking on realestate.com.au for houses (not apartments) which have sold for around $2,000,000 recently near the CBD. Clearly there will properties near the beach, harbour or river that will sell for this price but I wanted to have the properties as “similar” as I could so I( or you) can compare them better. 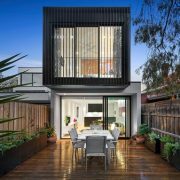 You’ll see that for around $2,000,000 you get a much smaller house in Sydney and Melbourne than in Perth. 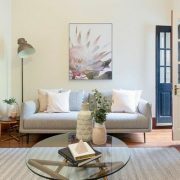 If you divide the purchase price by the internal living area or the size of the land you can start comparing the properties. This shows that you get about 2.5x the living space in Perth compared with Sydney and around 4x the land. Relative to Melbourne you get about 2x the living space in Perth and around 3x the land. 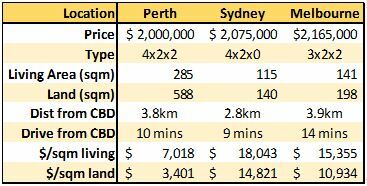 Certainty there seems to be less available land in Sydney and Melbourne than in Perth so you would expect a premium on land. 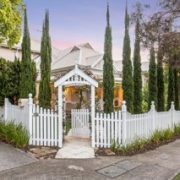 It would be like saying to you (assuming you own your property and are reading this in Perth), your property would cost the same if you cut the size of the land by three quarters (75%)! In terms of internal living space premium, some of that premium can be explained because double story is more expensive to build than single story so I’m less surprised about this. The land premium is difficult to explain and I’m still scratching my head a bit! I’ll do a the same analysis for $1,000,000 and $500,000 over the next few weeks. Stay tuned.